We are offering Shake Glass. We are catering only bulk queries Prices are vary according to sizes , design and also depend upon the market fluctuation. 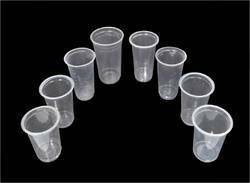 Our range of disposable glass is manufactured using quality food grade material. These disposable glasses are well designed in required sizes as per the specifications detailed by our clients. Our range of disposable glass is widely used for mineral water, domestic use and parties. We offer these at competitive prices. We are manufacturer of thermoformed like food trays, seedling trays, disposable cup, glasses, bakery trays, chocolates packaging, food containers, medical packaging, dairy containers, biscuit trays, meals tray, thermoformed packaging products, vacumm formed packaging. To retain our goodwill in client's consideration, we are manufacturing an excellent quality range of Disposable Glass. - Glass size 250 ml.